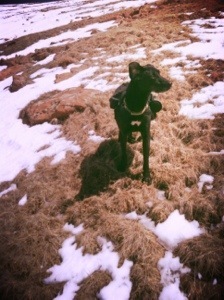 On Monday I posted the story of the time we tried the Pike’s Peak winter ascent…and failed. 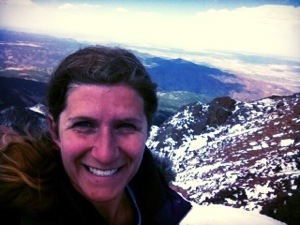 This is the story of when I attempted to summit Pike’s Peak…and made it. 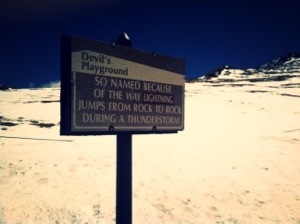 We started at the Devil’s Playground trailhead, from the Crag’s campground parking lot off highway 67 south of Divide. The round trip hike is 14 miles, assuming you’re able to stay on the trail and don’t take any detours (hahaha as if anyone has any idea where the actual trail is under all that snow) and gains 4,300 feet in elevation. Below tree line, it was mostly dry and a little icy, as the several feet of packed snow was finally melting then freezing due to the high temps. We made it to tree line pretty quickly. I saw my first and only fellow hiker just before, on his way down (he turned around at tree line); there were two other cars in the parking lot, I never did see anyone from the other car. Still in high spirits at tree line, the weather was beautiful and we set out on a mildly marked trail following snowshoe prints. The wind picked up, but it wasn’t cold and it wasn’t picking up snow and throwing it around. Clear skies and sunshine. Pretty soon, the “trails” collided and I joined the same path as everyone that had come before me. 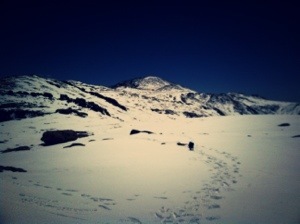 Which is an interesting feeling, following the footprints of the ghosts who walked these mountains. And really, I was using their post holes, so I was exactly following their footprints! The wind picked up pretty hard and I finally put mine and Luna’s coats on for protection. Still wasn’t cold though. When we hit Devil’s Playground we completely lost the trail and had to break one ourselves for the first time. From this point on, we never actually found the trail, although we’d occasionally find footprints again but they seemed just as erratic and lost as we were. Somewhere in this section, after we crossed Devil’s Playground but before we reached the final rocky ascent to the summit, I got miserable and almost turned around. I don’t remember if it was wading through the snow in the valley or navigating the rocks in the snow and ice (which was treacherous at best). Once you cross the last peak and head down into that little shoulder part before you ascend up to the summit, you get a view of what you’re in for and it seems so epically far away that summiting suddenly seems impossible. We stopped to eat and snuggle and find some serious morale to keep going. This is where I began talking directly to the mountain, which I would continue for the rest of the day. 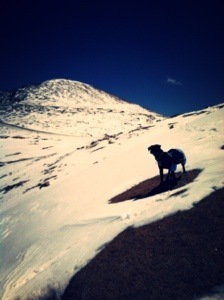 Now, I know I was struggling with altitude sickness a little by this point because I had a slight headache. 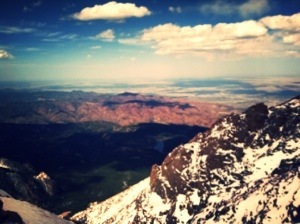 I don’t remember what all I said, but I definitely remember asking Pike’s Peak to protect us. I’m pretty sure I talked almost constantly during the final, grueling, soul crushing, scramble of an ascent. Climbing like a spider over the large rocks, desperately avoiding breaking a leg in the snow filled crevaces between them, and probably moaning desperately, I kept my eyes one foot in front of me. When I finally reached the 10 feet or so of snow after the rocks end and you approach the real, actual summit I looked up and couldn’t believe it. I crawled, literally on hands and knees, until I reached bare ground, laid my head down, and cried. What I think is really tragic about the fact that Pike’s Peak Highway goes up to the summit, where you’ll find a parking lot and a gift shop, is that what do these people gain from the view? By the time you summit a mountain on foot, you are a part of it and it is a part of you. And the view from the top is sort of the infinity that you are together, the mountain and you. It was the most beautiful thing I’ve ever seen. But the view from the car seems approximately like looking at a photograph: many things that exist in nature are beautiful objectively, but just seeing the physical outline of them is not the same as the experience of being a part of them. I knew that I was well behind schedule so once PP and I had our sweet moment together, I set out to look for the registry and the signs that you find at the summit of fourteeners. Now, since they had to plow the parking lot there were huge piles of snow everywhere in addition to the cars and it was difficult to see everything. I was in a hurry, so after some unfruitful looking around I went into the gift shop and asked the ladies behind the counter. They didn’t know what I was talking about. “The hiker registry-it’s usually in a capsule next to a big pile of rocks” “Wait, did you hike up here?” “Yes” “I don’t know what you’re talking about, do you know what she’s talking about?””Registry? No”. Sigh. I took another look around. There was a long line of people taking pictures at the Pike’s Peak Summit sign (14,110 feet!). Ultimately, I had to head back down before I lost the weather or the daylight, so I gave up and began my descent. So the descent is when things got really weird. Sometimes I would just sit down in the snow and think “if only I could just take a nap.” And it would take me five minutes of saying out loud “Sarah you need to get up. Get up. You need to get up. You need to keep going.” The thing about fourteeners is, you’re miles into the middle of nowhere, and at very high elevation. Once you’re out there, you have no choice but to come back (or to lay down in the snow and die), you can’t just give up. Getting back across and to treeline was a big struggle. 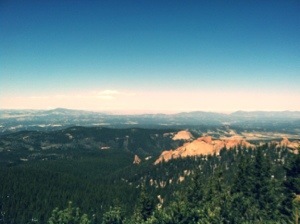 But from there, it was only a couple more miles down and the altitude sickness started getting immediately better. I sang out loud the last two miles or so. It’s kind of funny realizing what songs you know all the words to (and what songs you think you know all the words to but clearly don’t). The trip took almost 9 hours all said and done. When I sat down in the car I just said “we made it.” No big deal. We fueled down at McDonald’s because that was the first fast food place we saw (Coke and fries, and you’d better believe Lu got a few fries, but I also had some fuel down peanut butter for her). Snowblindness. Did you know that’s a thing? My PSA for you: WEAR SUNGLASSES ALWAYS. Snowblindness (also called Surfer’s Eyes) is when the clear layer over the colored part of your eye gets sunburned because of the UV reflections off of snow (or water). It is just as painful as it sounds, and I literally spent all of yesterday in bed because I couldn’t open my eyes.